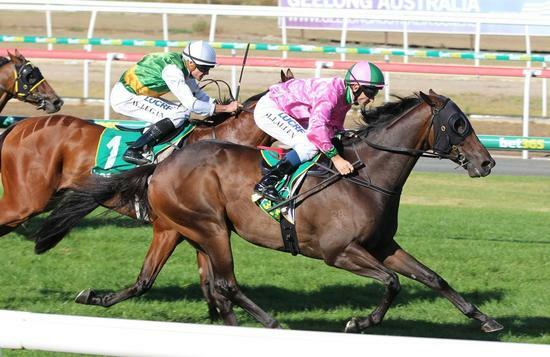 "He just takes a while to get fit," said Beth Schroen after the double figure odds victory recorded by Saveyourenthusiasm at Geelong on Thursday, a win that came to the surprise of many but not to form students who noted his good form at BM58 level. Dropping in grade at his fourth run back, the son of Savabeel had been a bit chubby in the lead up but he won at the same stage of his last campaign so the signs were there! And then of course there was Matthew Allen's stellar ride on the five-year-old, a horse he knows well. "He can be a bit lazy and he was off the bit the whole way, he just doesn't take you into a race and he makes you work!" Settling back along the rails, Saveyourenthusiasm was aided by a strong pace and was going well enough turning to just need a bit of luck - which he got. "He is a staying type who was always going to be strong late," Allen said, noting that he had no option early from the inside gate bar going to the rails. "I just wanted a spot where I could pan out in the straight." After saving ground close to the fence turning, Saveyourenthusiasm was able to get into clear running and his final 100m was strong as he hit the lead and drew clear by half a length - in doing so recording the fourth success of his 20 start career. "It was a great ride, he smothered him up and found just the right moment to peel him out." A graduate of the 2015 NZ Ready To Run Sale, Saveyourenthusiasm is one of four winners for the city winning Danasinga mare Curbyourenthusiasm, daughter of the Gr.3 mare Starcent whose other descendants include the stakes winners Strike The Stars, Delta Girl and Marseille Roulette. This is a strong black type family, Saveyourenthusiasm also able to boast amongst his relations the Gr.1 gallopers Sacred Star, Embellish and Diademe.